Daejeon city is located in the center of South Korea: 167.3 km from Seoul, 294 km from Busan, and 169 km from Gwangju. To the East lies the Gyungbu Expressway, to the West the Honam Expressway. The city is surrounded by four mountains. Mt.Gyeoryongsan, Mt. Gyejoksan, Mt.Sikjangsan and Mt. Maninsan. 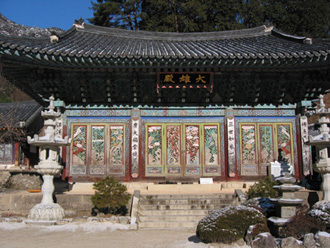 The city is located along three major rivers, Gapcheon, Yudeungcheon and Daejeoncheon. In 1993 Daejeon hosted the International Exposition (EXPO). Nowadays, the expo site has been transformed into a science park. This is a good place to spend a day or two investigating the remaining pavilions. The pavilions range from fairly didactic displays to some really exciting sci-fi simulations. There is also a neighboring theme park called Kkumdori Land. It offers the usual mix of amusement rides, including a roller coaster. It is a particularly good place to bring children. If you go on weekends however, be prepared to wait in line to enter some of the better pavilions.